In 2006, Clive published his diary of the 1996 tour of Frank McGuinness’ ‘Observe the Sons of Ulster Marching Towards the Somme’. The 100th anniversary of 1916 and the Battle of the Somme provides an opportunity to reflect upon the historic events. 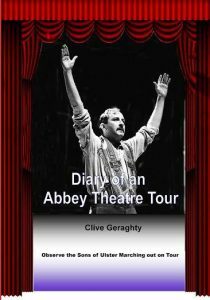 The writer, a retired member of the Abbey Theatre acting companycompiled a diary while touring in the UK in 1996 as he and his colleagues performed in the celebrated Frank McGuinness play ‘Observe the Sons of Ulster Marching Towards the Somme’.